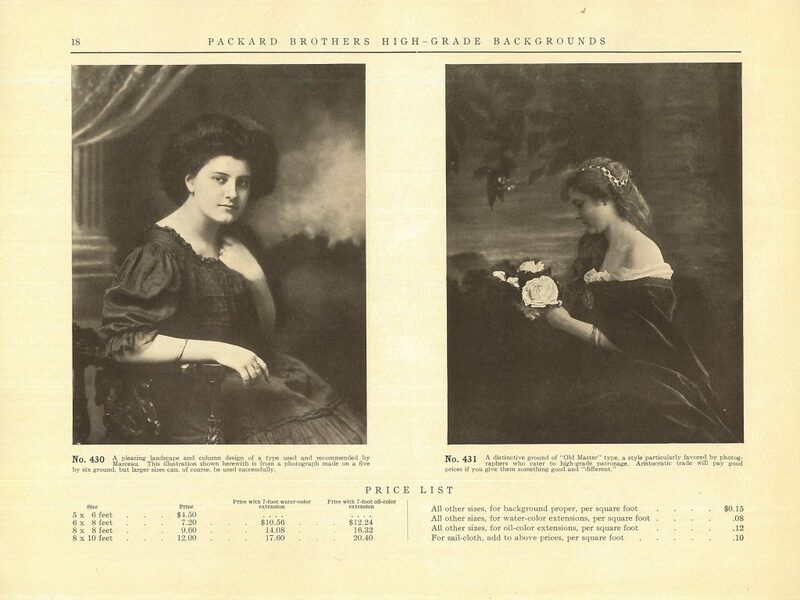 Decorative painted backgrounds had been in use since the early days of studio photography in the mid-1800s. 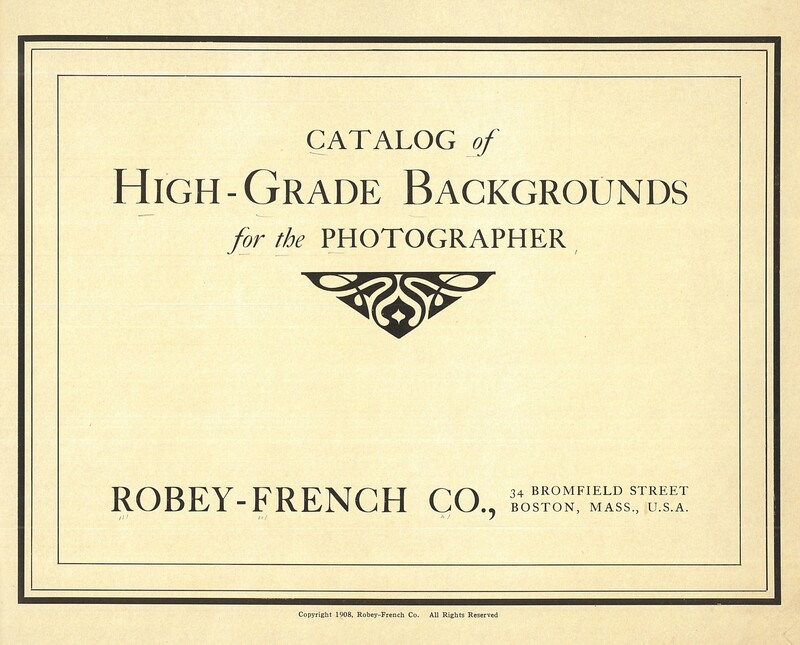 In the Trade Literature Collection at the National Museum of American History Library, we have a 1908 catalog of beautiful backgrounds created by the Packard Brothers and sold by the Robey-French Co. of Boston, one of the first photography supply businesses in New England. 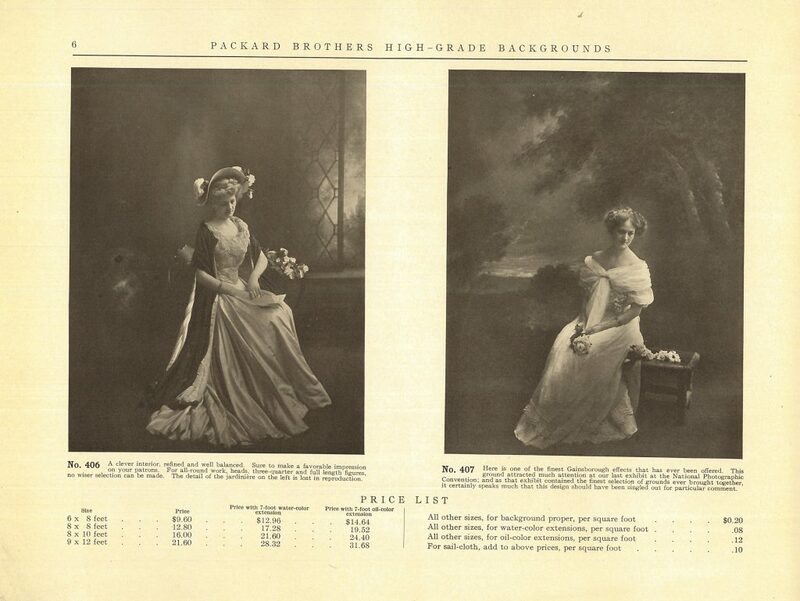 The painted backdrops featured in this catalog were designed or suggested by prominent photographers of the day, including John Higue Garo and Theodore Marceau, whose work is represented in Smithsonian collections. 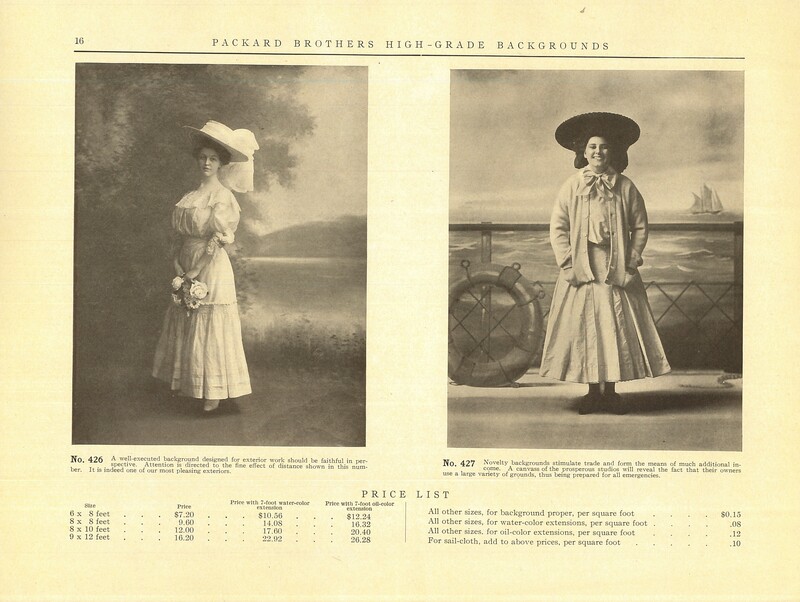 The backgrounds were painted on fabric, usually sailcloth, by skilled artists working for Messrs. Packard Brothers. They were offered in varying sizes from 5 x 6 feet up to 9 x 12 feet. The smaller sizes were suitable for close-up or three-quarter portraits. A photographer could add a 7-foot floor extension, coated in either watercolor or more durable oil paint, to enhance the overall effect for full-length portraits. As with today’s social media filters and frames, these backgrounds helped to create the perfect photo, putting the subject in a special setting – one that would evoke a particular feeling or atmosphere. A garden background may indicate the subject’s love of nature, or it could provide a pleasing pastoral setting, as in background No. 431 on page 18 shown below. A library backdrop, such as No. 417 on page 11, would perhaps show the literary tendencies of the person depicted. A travel themed background like No. 427 on page 16 may hint at the subject’s adventurous side. Some descriptions of the backgrounds say they were inspired by the Old Masters, which would lend a particularly artistic ambiance to the photograph. Background No. 407 on page 6 claims to be “one of the finest Gainsborough effects that has ever been offered,” referring to English painter Thomas Gainsborough who was known for his portraits featuring lush landscapes behind the sitter. The photographer may also have used props, such as furniture, a book, or a bouquet of flowers, to add variety and interest to his studio portraits. 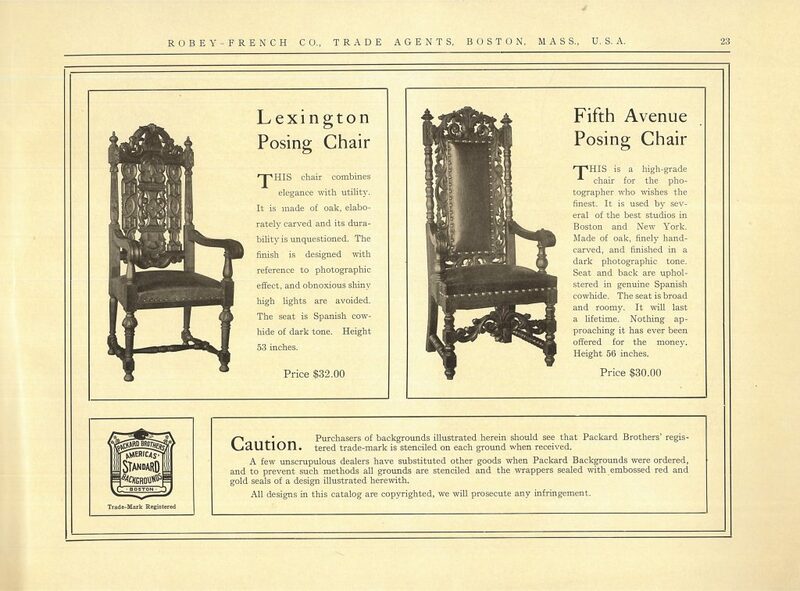 In fact, this catalog includes two “Posing Chairs” for sale on page 23. Such chairs were usually ornate with glossy highlights or elegant details to complement the theme of the painted backdrop. 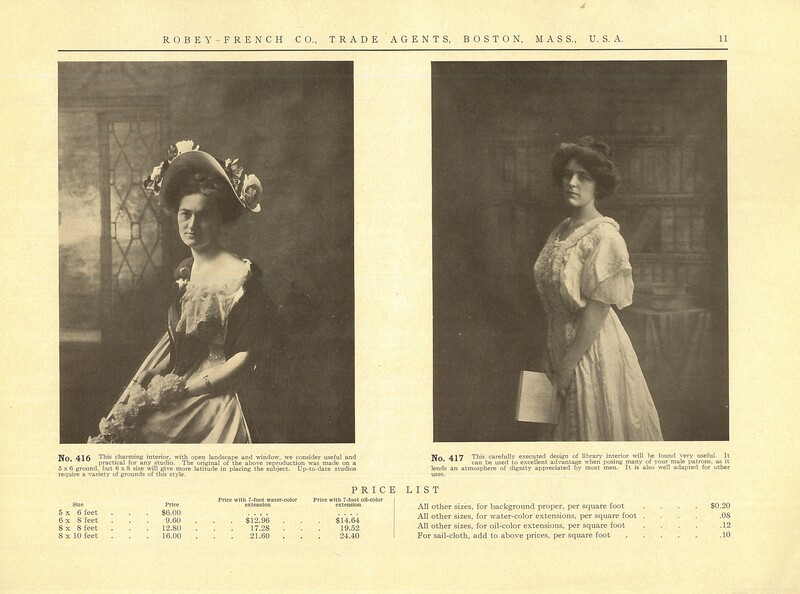 Many photography studios had a number of backgrounds available for sitters to choose from, allowing them to pick one that suited their personal style or that would present them as they wished to be seen. Just like today’s social media frames and filters. So yes, everything old is new again. Trina Brown is the Head Librarian at the National Museum of American History Library.